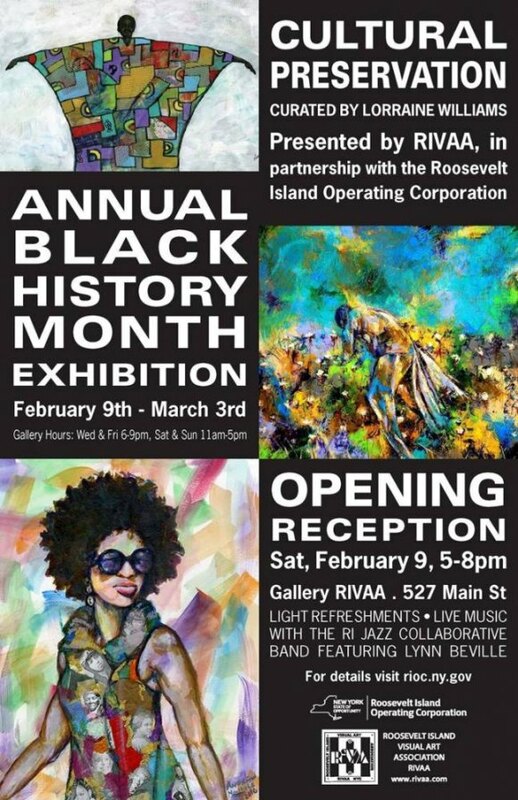 Opening Reception February 9th, 5:00 to 8:00 p.m.
2019's celebration, Cultural Preservation, is curated again this year by Island resident Lorraine Williams. RIVAA, dynamically partnered with RIOC, promises an "eclectic showing of art (in) a variety of mediums, styles, and messages." It features work from Andrew Nichols, Aziza, Bianca Dorsey, Ida Owens, LeVar “Var” Lawrence, Mauricio “Gleams” Baez, Micheline Hess, Mona Coichy Haigler, N. Steven Harris, Saundra Lamb, as well as art and artifacts from Nigeria and Madagascar. You're invited to an opening reception on Saturday, February 9th from 5:00 to 8:00 p.m at Gallery RIVAA, 527 Main Street. Enlivening the main event will be music and spoken word performances from The RI Jazz Collaborative with Lynn Beville, and a special reading by David Lamb and children from the Roosevelt Island Youth Center. Gallery RIVAA hours for the exhibition are Wednesdays and Fridays from 6:00 to 9:00 p.m, Saturdays and Sundays from 11:00 to 5:00 pm. Cultural Preservation closes on March 3rd.